1930s pair of French rustic vintage wooden armchairs. 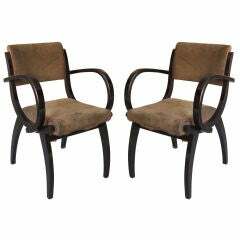 1970s pair of Spanish wood imitating cane bamboo armchairs, decorated with Orientalist geometric motifs. Hand carved pair of Spanish 18th century 'Fraileros' chairs, with 19th century seating and backrest upholstery, joined to the walnut frame using the typical Spanish bronze nails. Spanish pair of eagle shaped wooden armchairs, 1990s Covered by detailed hand carved feathers, claw legs, topped with eagle heads and back tails that touch the floor. 1970s pair of Spanish handmade laced wicker over a wooden structure armchairs. Simple wooden stool with a great look! 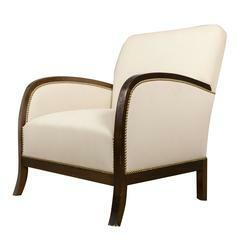 Armchairs, a pair in rattan and wood. France, 1920s-1930s. Astonishing pair of French orange armchairs in parchment, 1930. Unusual deco armchair in limed oak with light blue fabric The arms have a recess to cups, objects, circa 1930s French. Reproduction of a French 1930s armchair. Not for sale. Rental only.